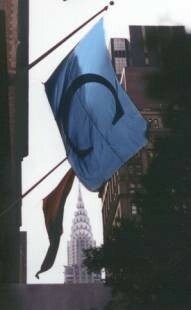 Welcome to the 21st issue of the Columbia College Class of 1963 eNewsletter. The leaves are off the trees, the cold weather seems to finally be about to hit, and the Columbia football team has finished with its first .500 record in years. No Ivy League Championship yet, but perhaps we're on our way! You have probably come to this eNewsletter through links from our new Class of 1963 web site, www.cc63ers.com. I hope that you critique it and give me some feedback. Also, I'd love to get your ideas and content -- stories, pictures, political polemics, whatever. As I mentioned last month, I thought it would be a good idea to start up our own, independent, easily controllable environment, while the College and University work out their plans for the future of the Columbia online alumni presence. Over the next few years I hope that it will grow into a rich resource for our class. Let me know what you think. You can always email me at pauln@helpauthors.com. Please join your classmates for an informal lunch at the Columbia Club every second Thursday of the month. It is our hope that these gatherings will renew old friendships and foster improved relationship with our class and the College. I hope you can all join us at the next lunch on Thursday, December 14. Let me know if you will attend so that we can reserve a big enough table; RSVP to Paul Neshamkin (pauln@helpauthors.com). Another great turnout for lunch last month! The 8 who attended included returnees: Gerry Dwyer, Doron Gopstein, Paul Neshamkin, Larry Neuman, Tom O'Connor, Barry Reiss, Jeff Thompson, and first-timer Paul Kimmel. Paul told of us his life as a High School chemistry teacher in New Jersey, and shared stories of his bicycling adventures. Doron surprised the group with a rare piece of ephemera from our past, the reading assignments and schedule for Humanities A. Join us next time! . 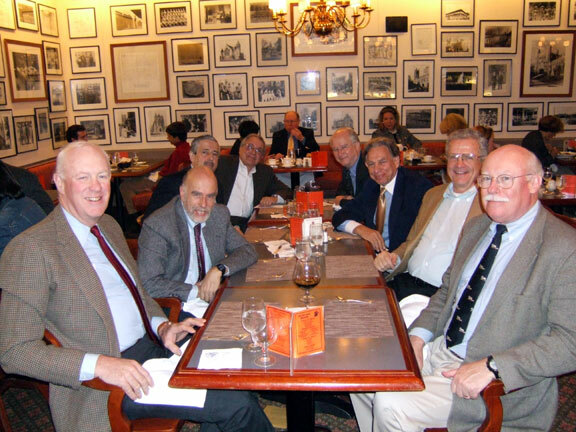 (From left to right) Jeff Thompson, Paul Kimmel, Doron Gopstein, Barry Reiss, Gerry Dwyer, Larry Neuman, Tom O'Connor, and Paul Neshamkin. After last month's lunch, I asked Paul Kimmel to tell us more about his life, he writes, "I've now in my 37th year teaching chemistry at East Brunswick High School. For the past 20 years I have also been doing the evening General Chemistry lectures at Rutgers. This keeps me pretty busy. In addition I'm a College Board Consultant and as such, conduct AP Chemistry workshops over the summer. At EBHS, one of my activities is coaching various science competitions, with which we have had a fair amount of success, with a number of first-place New Jersey finishes in a variety of events. Last year, one of my students was one of four in the US to be selected to participate in the International Chemistry Olympiad, which took place last summer in South Korea. He won a bronze medal. A prime recreational activity is bicycling, and New Jersey has lots of scenic back roads with plenty of hills. I do most of my riding on a tandem with my wife Jane, and occasionally still ride the 3-man triplet bike which I used to ride with my sons when they were younger. Last summer, we took the triplet across New York State, from Niagara Falls to Saratoga Springs, as part of an organized ride called FANY (five hundred miles across New York). I've attached a photograph of myself, Jane, and our friend Maria, who rode the triplet with us on that trip. I've also attached a family picture of myself, Jane, and our four sons, Louis, David, Joseph, and Aaron, along with Louis's fiancee Christine." Paul, thanks for sending in your notes and pictures. As an experiment this month, I will add notes as I receive them, so come back and visit this page to check for new additions. Send in your notes and pictures, and I will add them immediately. Instant gratification! Patrick Cary-Barnard writes from the Cold North, "I have had a hectic fall...First, I was inside Montreal's Dawson College when a psychotic came off the street and began shooting people, killing one person, wounding a number of others, and then finally killing himself. I evacuated my English class, then found myself going the wrong way down a corridor, beating a retreat, listening to strange sounds in the air: "zip...zip." After that event, the City of Westmount announced it wanted to cover the beautiful park in front of my house with synthetic turf...Westmount Park, an Olmsted-inspired gem of North American landscape gardening, and the "green" City of Westmount wants to destroy its southern end! If you visit www.savewestmountpark.com then you can see what kind of a group we have founded, one which belongs to the National Association for Olmsted Parks (NAOP) in Washington. And finally, I am back to radio and acting, playing the announcer in Montreal's David Fennario's Fessenden's Follies, a radio play about Reginald Fessenden, the "Father of Radio." That program will be broadcast at Christmas time across Canada and at WATD 95.9 FM Marshfield (Brant Rock) Massachusetts -- that's where Fessenden did his first work." Ken Robbins emails, "My older son Peter C92L95 is a lawyer with the Department of Commerce and has gotten married to Hanna. Peter is pursuing his love of bass fishing and has written many articles for bass magazines and online sites. My younger son Michael C96 is moving with his wife Gretchen and daughter Madeline to Tokyo where he will join the office of Bain Consulting. My wife Joyce TC66 is a behavior therapist for anxiety disorders especially OCD and I am still working as a psychiatrist. I have just edited a book "African Elites in India" and am working on another book about Jews in India/Jewish communities of India. Does anyone know how to reach Bob Steckler?" Bob, I sent Ken your email address. Send us a note and let us know what you are up to. I then received notes from Bruce Miller, who says "I will be in New York during the week of January 7. I would like to join the group for lunch on January 11. Please let me know what time you meet and the coordinates of the restaurant." Bruce is coming up from Fort Worth, Texas, where he teaches Physics and Astronomy at Texas Christian University. You can visit his Web site at http://personal.tcu.edu/~bmiller/. Carey Winfrey wrote to suggest that "You might consider creating a class database on the site, listing the names of the entire class, then inviting each class member to fill in his pertinent information at his leisure: addresses and phone numbers, spouse’s name, children’s names and ages, occupation if still working. Comments optional. Infinitely updatable. It could grow like a Wikipedia encyclopedia. Or maybe you’ve already done that." Is that something that would be of interest to you? Let me know. When I wrote back to Carey he sent me the following personal news, "I’m in my sixth year as editor of Smithsonian magazine, still enjoying it, no plans to hang up my typewriter anytime soon. (Certainly not before I produce an issue I like.) To my surprise, after more than forty years of living contentedly (and disdainfully, re other burgs) in Manhattan, I’m finding Washington D.C quite comfortable. As somebody said to me when my wife, Jane, and I first moved here, “Washington is New York on lithium—they’ve removed the highs and the lows.” And the older I get, the more willing I am to give up the highs to avoid the lows. Also gratifying: our identical twin sons are both gainfully employed, in agencies a continent apart. My son Graham works as an assistant to a talent agent in Los Angeles, and Wells works as an assistant media analyst for an advertising agency in New York City. All in all, I feel very fortunate, our foreign policy (if that’s the word) notwithstanding. My old fraternity brother, Jeff Parsons writes, "I appreciate reading your column, although, like me, most of our classmates have been lax about keeping us posted. I was glad you located my dear witty friend (I hope this characterization still applies), Patrick Cary-Barnard. Please reprint his address. I was also gratified to learn of Ezra Cohen's recent honors. He was/is another good-humored (fellow southerner in the awesome NYC/Columbia environment) who I enjoyed immensely. Sadly, I've been out of touch with these and most other alumni, except for periodic reunions with good friend Steven Marx--professor of English at Cal Poly in San Luis Obispo and author of several academic books, including "Shakespeare and the Bible" from Oxford Press (Professor Chiappe, who taught so many of us Shakespeare at Columbia would be as proud of him as I am); and brief conversations with Stephen Caldwell, who is flourishing in upstate NY and has, I believe, finished his second novel; with "Buddy" Stein, who, I understand, won a Pulitzer prize (Incidentally, that would make a good feature article for "Columbia Today" and elsewhere); and Ceasar Adams, an independent wordsmith employed by the Ca. State Dept of Forestry (no doubt a uniquely literate department of forestry!) and whose modesty may have prevented him from sharing other kudos. Since leaving Columbia, I did social work in East Harlem, taught English at Fisk University in Nashville; was a copy and production editor at Prentice Hall in NJ; and subsequently, a stone sculptor, tile-setter, and musician in NY, California and Brazil. I've been married twice and have six beautiful daughters, ages 17 to 40 (the youngest, Dakotah, is now at Sarah Lawrence). I live in the gorgeous coastal range near Garberville, Ca. My just-released CD: "Jefferson and Friends--The Baby and the Bathwater--New Songs for Peace and Justice" can be ordered for $15 (including shipping) from my e-mail address and is available on the web from porchswingmusic.com; a portion of the proceeds of the sale of this CD go directly to move-on. org. I'd love to hear from any of you, especially A. Jacobs, T. Lewis, "Buddy" Stark, G. Zicklin, M. Silver, B. O'connell, F. Partel, D. Cummings, P. Neshamkin, F. Sypher, and, of course, the other friends mentioned above and any I've forgotten to mention." You can reach Jeff at 6700 Bell Springs Rd., Garbervi;lle, Ca 95542, email to jefferson@asis.com. Jeff, it's great to hear from you after all these years. I certainly want to learn more about your music. My lasting memory is of you going through the House singing "My Ding-a-ling" (in the original version). I hope some of the people you mention above get in touch with you (and me). Another classmate who hopes to make the NYC lunches is Steve Clineberg, who writes, "I am retiring at the end of the year. My hope (which may be a fantasy) is that it will free up some time for Lin and me to get up to NYC and get to one of your lunches. Since you copied the idea from the WDC branch (we have been doing monthly luncheons here for over 15 years) I feel some obligation to drop in on one of yours and compare notes. Have not seen [Joe] Fisher in over a year but will try to reconnect soon. I did hear from Frank Partel (fundraiser). My favorable response is in the mail. Which reminds me, the Alumni Office will chastise me if I don't remind you all to give generously to the Columbia College Fund. If you are in the habit of giving at year end, please do, or if you wait until the end of the fiscal year in June, make sure to give then. It would be terrific if we could get our class participation rate up to a high level. Right now, we are lagging well behind our friends from '64 and '65, which just will not do!